Alan Lee Beaumont was born in Newcastle, NSW on 24 December 1934 and joined the Royal Australian Naval College in 1948. After graduating in 1951 he undertook training in both the Royal Navy and Royal Australian Navy before promotion to Lieutenant in 1954. He completed a Torpedo Anti-Submarine Specialist course with the Royal Navy in 1959-1960 and later served periods of exchange service with the Royal Navy and United States Navy as a specialist in that field. As a junior officer, he served in HMA Ships Australia, Bataan, Shoalhaven, Vengeance, Fremantle and Quickmatch and HM Ships Maidstone, Armada, and Lewistone. His shore postings included HMAS Cerberus, HMS Vernon, HMAS Watson, Navy Office (Canberra) and the United States Navy Fleet Anti-Submarine Warfare School, San Diego. He was Officer-In-Charge Torpedo Anti-Submarine School, HMAS Watson 1969-1971, having been promoted to Commander while Executive Officer of HMAS Brisbane during the ships period of service in the Vietnam Conflict in 1969. He commanded HMA Ships Ibis (1962), Yarra (1972-73) and Vampire (1978-79). His Staff postings in Canberra included Director of Underwater Weapons, Follow-On Destroyer Project Officer and Director General of Naval Plans and Policy. He was also Director General Defence Force Administrative Policy and Assistant Chief of the Defence Force (Policy) in ADF Headquarters. Admiral Beaumont was promoted to Rear Admiral in June 1987 and assumed the duties of Assistant Chief of Naval Staff (Development). He was appointed to the post of Assistant Chief of Defence Force (Personnel) in December 1988. Admiral Beaumont was promoted to Vice Admiral in September 1989 and assumed the appointment of Vice Chief of the Defence Force in September 1989. He served in that position until October 1992. He was promoted to Admiral in April 1993 and commenced his appointment as Chief of the Defence Force. Admiral Beaumont retired from the Royal Australian Navy on 6 July 1995. 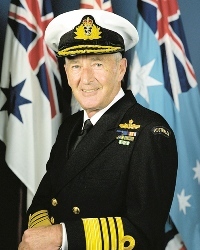 Admiral Beaumont was a graduate of the Australian Joint Services Staff College (1976). He was promoted to Companion in the Military Division of the Order of Australia in the 1992 Australia Day Honours List for services as the Vice Chief of Defence Force. In so doing, he became the first Australian to achieve three awards in the Order of Australia having been appointed a Member of the Order in 1982 for service as Director of Naval Plans and Officer of the Order in 1989 for service as Assistant Chief of Naval Staff (Development). Admiral Alan Beaumont AC RAN (Rtd) passed away on 21 September 2004.